Tripoli, 22 July 2017. 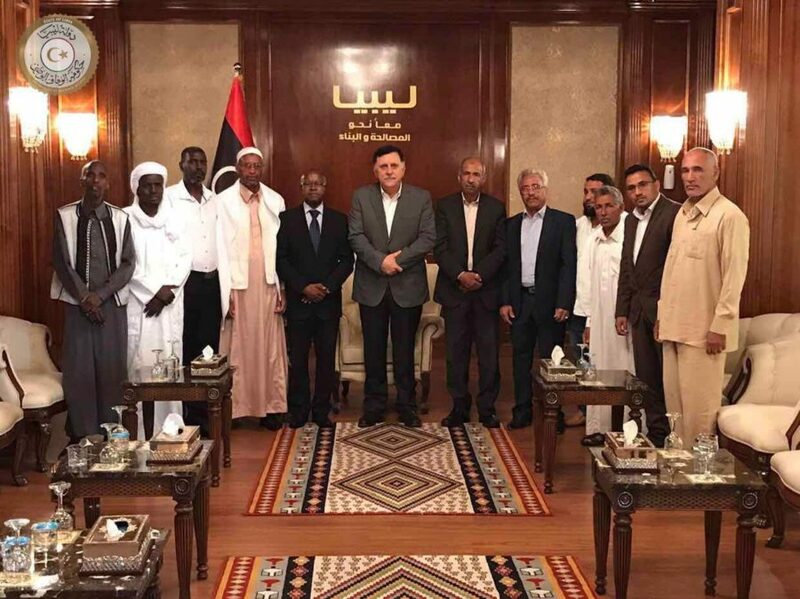 The President of the Presidential Council of Libya Faez Al Serraj has met the two commissions of the notables and elders of the Tebu and Awlad Suleiman tribes to address implementation of the reconciliation agreement between the two tribeson 22nd July 2017 in the Presidential Office, in Tripoli.. The permanent Peace and Reconciliation Agreement between the Awlad Suleiman and Tebu was signed in Rome on 29th March 2017, in the presence of Abdulsalam Kajman, Vice President of the Presidential Council of Libya. 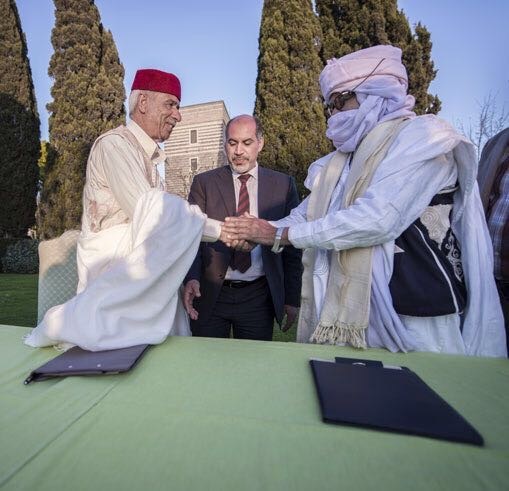 The agreement was signed by Sheikh Zilawi Minah Salah, Sultan of the Tebu of Libya and by General Senoussi Oumar Massaoud, President of the Council of Notables of the Awlad Suleiman, in the presence of a high ranking delegation of the Tuareg. Negotiations between the Tebu and the Awlad Suleiman were organised and facilitated by the Ara Pacis Initiative, an international not for profit organization based in Rome, dedicated to supporting the human dimensions of peace. The initiative was supported by the Italian government through the Ministry of Interior and the European Union. The negotiations were held under the auspices of the Libyan Presidential Council. The two tribes have now completed the collection of data regarding the damage to people and property which occurred during the conflict and presented the documentation regarding compensations. President Al Serraj was very pleased and welcomed the two tribal commissions and blessed the path they had taken to resolve their conflict. The Presidential Council is ready to implement all the points of the agreement between the two tribes, and is convinced that the people of South Libya have the right to have a concrete response to their aspirations. The Presidents of the two commissions thanked President Al Serraj for his support for the reconciliation, development and security of the south of Libya. The leaders of the commissions commended the Libyan President and declared their support for the statement he made last Saturday announcing elections for next March. They pointed out that this is the right way to lead Libya out of crisis and restore stability in the country. 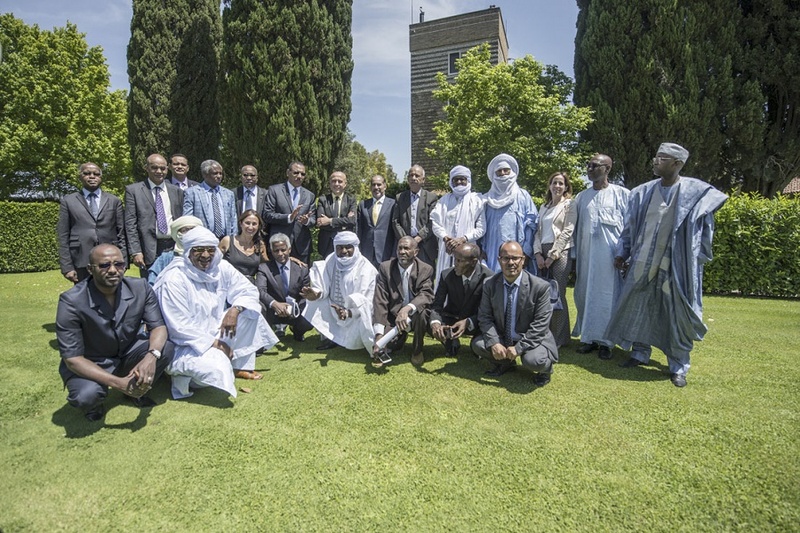 Representatives of Tuareg, Toubou and Awlad Suleyman tribes give their full support to the agreement signed in Rome Sunday 21 May by the Interior and Security Ministers of Chad, Italy, Libya and Niger. The event was promoted by Ara Pacis Initiative and sponsored by the European Commission. A further step was thus taken to consolidate the peace and reconciliation agreement between the Libyan Awlad Suleyman and Tebu tribes, facilitated by the Ara Pacis Initiative with funding from the European Commission in December 2016 and signed in the presence of the Tuareg leaders on March 28 under the auspices of the Italian Minister of Interior, Marco Minniti and Vice President of the Libyan Presidential Council, Abdulsalam Kajman. Chadian, Libyan and Niger ministers and tribal leaders call for the immediate implementation of this reconciliation agreement on the part of the Libyan Presidential Council, Italy and the European Union, also in light of the Joint Declaration by the Interior Ministers of Chad, Italy, Libya and Niger, signed on May 21, 2017. The Awlad Suleyman-Toubou Reconciliation agreement is considered fundamental in view of maintaining the trust of key parties involved and as a necessary condition for lasting peace and security throughout the region. Tribal leaders and ministers underlined the fundamental and binding importance of the link between peace, security and development, recalling the urgency of addressing the root causes of violence, terrorism, illegal immigration, illegal trafficking of drugs, weapons and human beings, which are to be attributed to extreme poverty, injustice and failure to honor the dignity of peoples. “By extending the scope of the cooperation with Libyan partners to the other two Saharan countries most affected by the phenomenon of illegal immigration, smuggling and terrorism, we have activated transnational tribal networks of solidarity to bolster the official agreements between states in an inclusive way, respectful of the dignity of peoples, key factors for achieving stability and peace,” commented Maria Nicoletta Gaida, president of the Ara Pacis Initiative. Among the signatories to the statement: Mohamed Bazoum, Minister for the Interior, Public Security, Immigration and Decentralization (Niger); Youssouf Barkay Minister of Institutional Relations (Niger); Ahmat Mahamat Bachir, Minister for the Interior, Public Security and Immigration (Chad); Youssouf Abassalah, Minister of Sports and Youth (Chad), Moulay Iqdeedi Amaa Quineedi President of the Libyan Supreme Tuareg, Alzalawi Mina Sale Qalama Alzalawi, Sultan of the Tebu of Libya, Alsunousi Masoud Zayd President of the High Council of Awlad Suleiman (Libya). Rome, 29 March 2017. 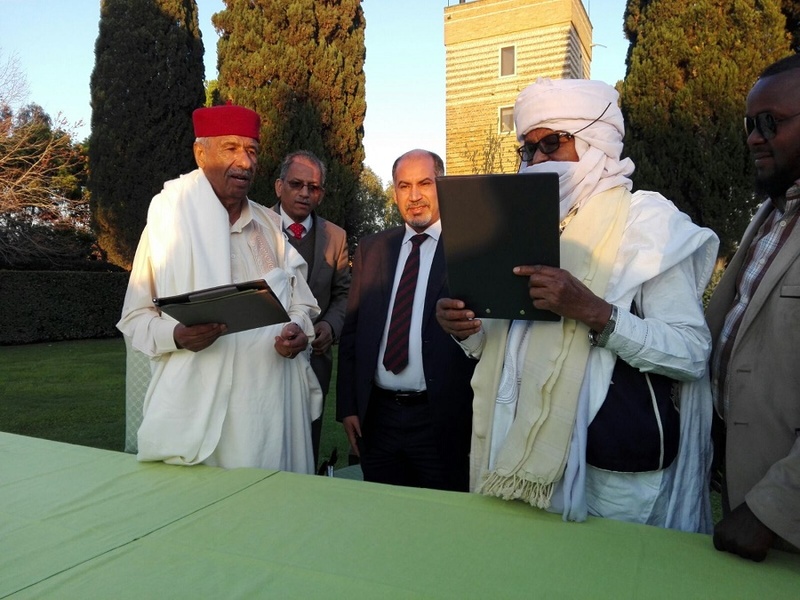 Representatives of two of South Libya’s strongest tribes – the Awlad Suleiman and the Tebu – signed a permanent Peace and Reconciliation Agreement in Rome in the presence of a high ranking delegation of the Tuareg. The agreement was signed by Sheikh Zilawi Minah Salah, Sultan of the Tebu of Libya and by General Senoussi Oumar Massaoud, President of the Council of Notables of the Awlad Suleiman. 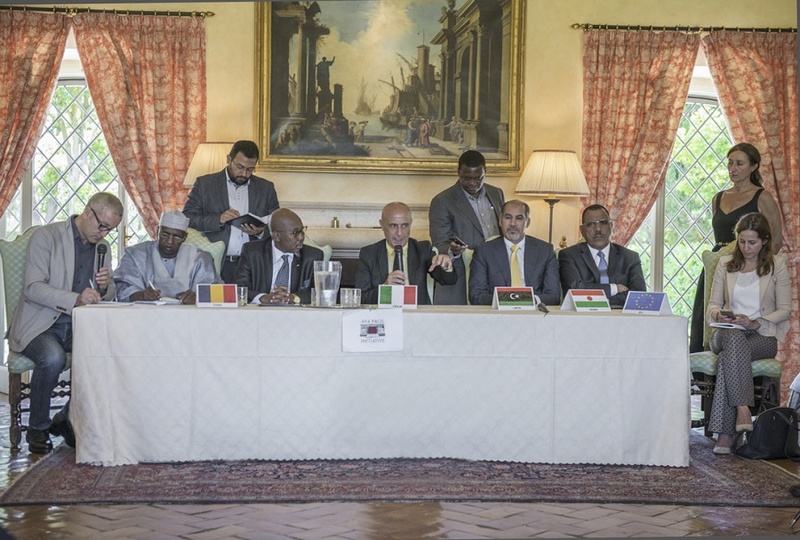 The solemn signing ceremony between the two powerful tribes of the great Fezzan region, was held in Rome on 29th March 2017, in the presence of Abdulsalam Kajman, Member of the GNA’s Presidential Council of Libya. 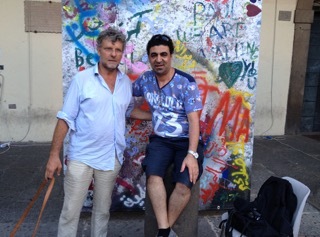 Negotiations between the Tebu and the Awlad Suleiman were supported by the Italian government through the Ministry of Interior and were facilitated by the Ara Pacis Initiative, an international not for profit organization based in Rome, dedicated to supporting the human dimensions of peace. Ara Pacis Initiative places the human being – with his/her needs, rights, moral resources, resiliency, creativity, spirituality, aspirations, dignity, and capacity to create new beginnings – at the core of conflict prevention, resolution, and transformation, and assists governments, institutions and communities in bringing divided peoples into restored, more just human relationships. 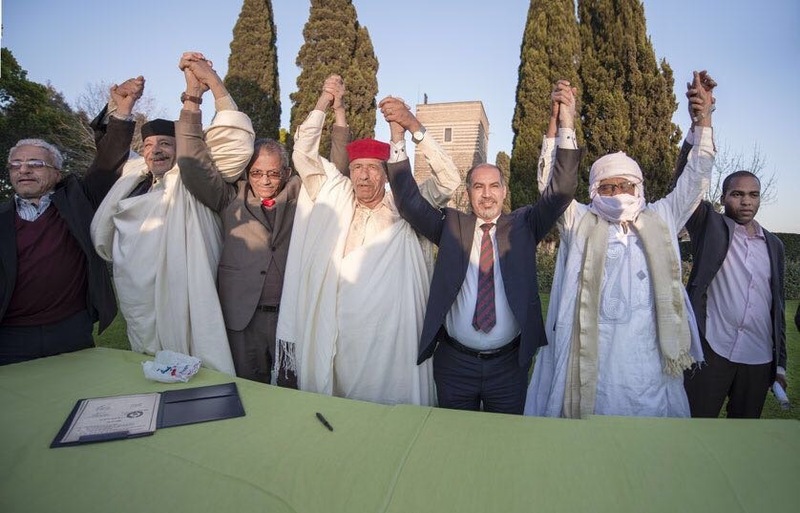 The permanent Peace and Reconciliation Agreement between the Tebu and the Awlad Suleiman tribes was signed at the headquarters of the Ara Pacis Initiative, Torretta de Massimi, and it was the outcome of intense and marathon dialogue sessions that began in Rome in December 2016, aimed at achieving peace, reconciliation, security and development in southern Libya in a perspective of contrasting human trafficking, illegal trades and terrorism. In the agreement, the two tribes agree to cease hostilities, to re-establish mutual trust and to do everything possible to promote peaceful coexistence. They also promise to work together for the security and development of their region in collaboration with all the other tribes of the Fezzan. 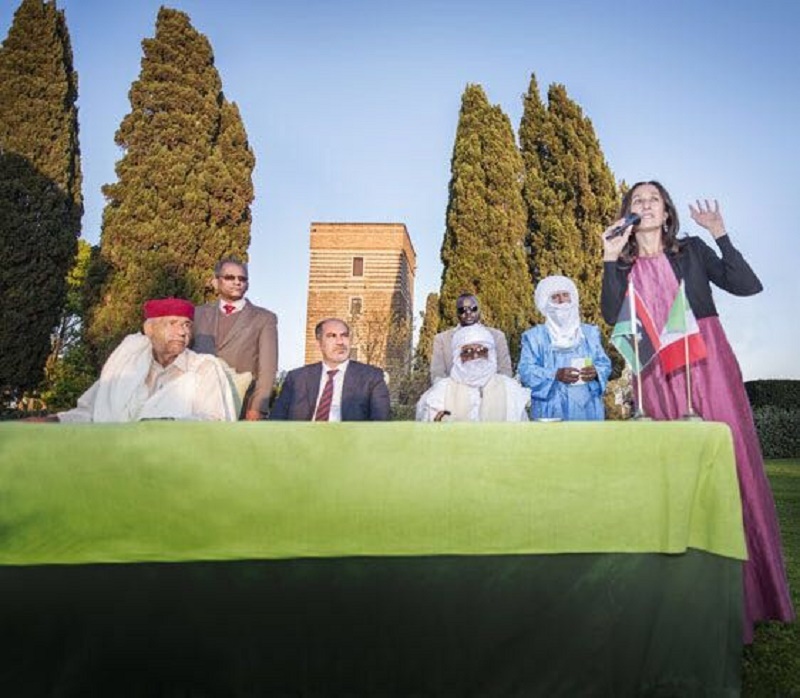 In his speech during the signing ceremony, Moulay Iqdeedi Amaa Qineedi, one of the leaders of the Tuareg delegation, congratulated the Awlad Suleiman and the Tebu delegations for choosing the path of peace and reconciliation. The ceremony to sign the agreement started with a prayer led by a Tebu Sheikh who read a Verse from the Holy Koran calling on all to be fair and good to theirs brothers because God hears and sees everything that men do. Referring to the members of the Awlad Suleiman as “our brothers”, the Sultan of the Tebu, holding the Tebu Constitution, said brothers may have conflicts between themselves, but the most important thing is to find a way to reconcile and make peace. He thanked the Ara Pacis and the Italian government for having strongly supported the reconciliation and peace agreement between the Tebu and the Awlad Suleiman. The Sultan also thanked the Libyan government represented by Vice President Kajman, for giving its auspices to the effort and moral support during the negotiations. In his speech before signing the agreement, General Senousi, president of the Awlad Suleiman Council, said they had for long waited and dreamed of “this historic moment”. He also thanked Dr Kajman for his moral support during the negotiations and for gracing the signing ceremony with his presence. “We are grateful to the Italian government, to the Ara Pacis Initiative and to the entire Italian people for having supported and helped us reach this historic moment,” General Senousi said. Stressing the importance of the agreement, the head of the Awlad Suleiman stated that the future of their tribes and of the entire Libya would depend on the success of its implementation. On his part, Dr Kajman congratulated the Tebu and the Awlad Suleiman delegations for reaching the Reconciliation and Peace Agreement. “This is proof that we are capable of achieving peace and closing a dark chapter of the past,” the Libyan Vice President said. He further thanked the Italian government for having supported the negotiations through Marco Minniti, Minister of the Interior, and Ara Pacis Initiative for working so hard to achieve this historic moment. Maria Nicoletta Gaida, President of the Ara Pacis Initiative, the organization that organized the meetings and negotiations, congratulated her “extraordinary friends” from the Tebu and Awlad Suleiman tribes for choosing to be architects of peace. “God is seeing this peace, God will guard this peace, and blessed are you who are the architects of peace,” Dr Gaida told the delegates. The signing ceremony was a joyful moment indeed. All present applauded and praised God as they shouted Allah Akbar (God is great) and Viva Libya, Viva Italy, while exchanging greetings and embracing each other. On the 31st of March, at the Interior Ministry, a second set of documents were signed by representatives of the two tribes, Vice President Kajman and the Italian Minister of Home Affairs, Marco Minniti, thus completing the process and opening the way to the implementation of measures in support of the reconciliation agreement. The delegation of each tribe was composed of the tribal chief, notables, local politicians especially mayors, representatives of the police and military, as well as elders and representatives of each clan and religious leaders. The two delegations met for the first time in Rome last December, with support from the EU’s Directorate General for International Cooperation and Development, Human Development and Migration, to explore the path towards an agreement of reconciliation and peace. On this occasion the two delegations broke the ice, decided to pursue the way of peace and were received by Minister Minniti who assured them of the full support of the Italian government in overcoming all the obstacles they could meet in their search for peace, reconciliation, security and development. Returning to Rome in March, each delegation held a series of separate meetings to come up with the terms and conditions for entering into dialogue to prepare the agreement. At the end of those meetings, each delegation prepared a draft of what it wanted to be included in the final agreement. The two delegations then officially met to share ideas on how to prepare the agreement. Each delegation read its draft proposal and it emerged that both proposals had many points in common. A commission composed of representatives of the two tribes was then formed to reconcile the two drafts and incorporate the other new ideas that emerged during the joint sessions. Vice President Kajman’s consultants and staff members of the Ara Pacis Initiative helped the commission sort out technical issues during the preparation of the final version of the agreement. Awlad Suleiman and Tebu tribes sign reconciliation agreement – Rome, 29 March 2017. Rome – 29 March 2017. 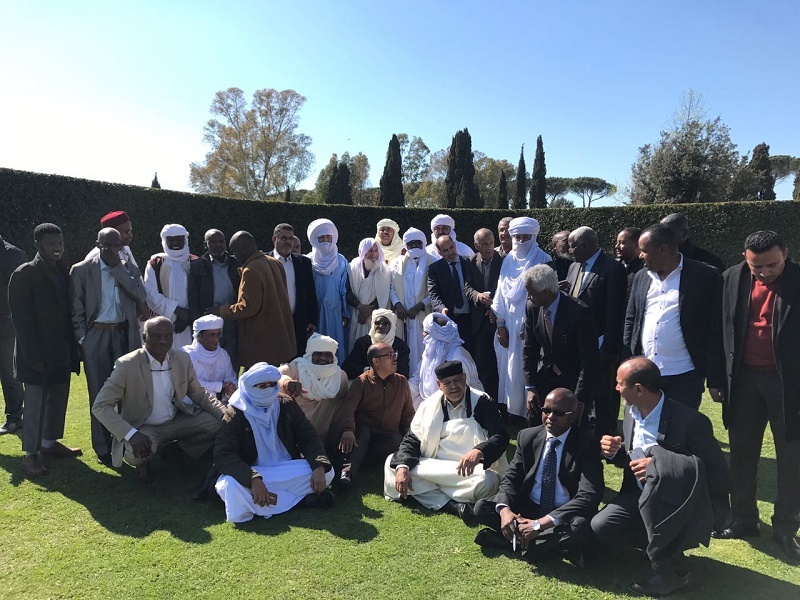 The tribes of the Libyan South – the Awlad Suleiman and the Tebu – in the presence of the Tuareg leadership sign their reconciliation agreement in Rome, Torretta dei Massimi, home of Ara Pacis Initiative. Viterbo, 28 July 2016. A special visual arts and musical event was dedicated by Syriaza participants to Father Paolo Dall’Oglio, an Italian Jesuit missionary who was kidnapped in Syria almost four years ago and has since disappeared. The event, created by Syrian artist Thaer Helal, featured gigantic posters of Father Paolo, on which audiences were invited to leave a “sign” of friendship and a musical performance by Paolo’s brother Pietro, accompanied by Syrian rap artists Mohamed Abu Hajar, Maan Alhasbane and many others.